In 2012, NAR applied to the Internet Corporation for Assigned Names and Numbers, which manages the Internet’s domain name system, to create and manage several new top-level domains, including .realtor. Now, the trade group has a signed contract with ICANN to launch .realtor. NAR estimates that it will make .realtor domains available to members this quarter, which ends on Sept. 30. “We are hoping to establish and announce a firm launch date within the next 30 days,” NAR spokeswoman Sara Wiskerchen said. NAR will provide one free .realtor domain for one year to the first 500,000 members who register, according to www.dotrealtor.org, the dedicated website NAR has created to help administer the domain. After that threshold’s been reached, Realtors will pay $39.95 a year for a domain. The .realtor top-level domain will be variations of “your_name_here.realtor.” Pricing for additional domains starts at $35.95 per year, with discounts for multiple domains and multiyear licenses. Bulk broker and franchise pricing is in development. A .realtor domain “provides a competitive advantage for you in the marketplace,” the site said. Realtor.com operator Move also plans to let agents turn profiles on the site into a stand-alone website featuring a Web address that ends in “.realtor.” NAR members who purchase .realtor domains will receive a free profile website from realtor.com that will incorporate mobile-responsive design and automatically imports content from members’ social networks and blogs. The site also lets members display all of their realtor.com listings, showings and closed transactions. 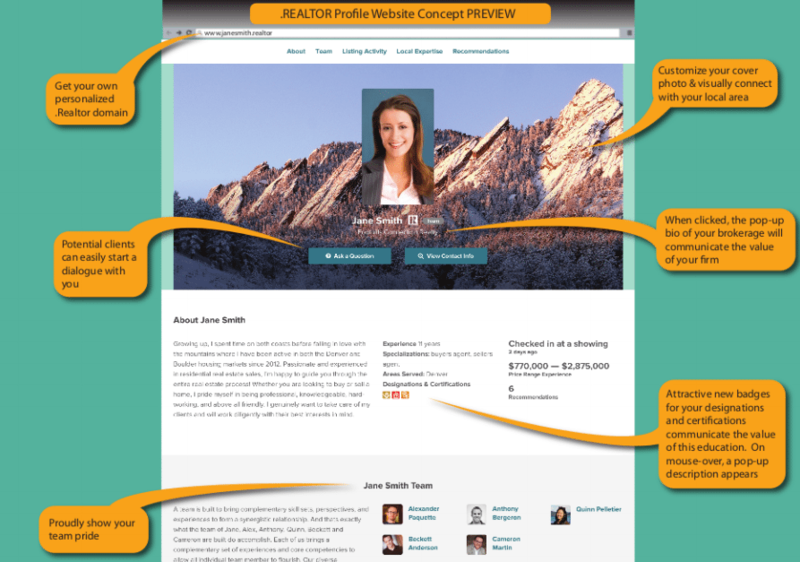 The site allows members to import client recommendations from LinkedIn, RealSatisfied and other sources, and automatically ask for recommendations from clients after closing a sale, according to a sample .realtor website. Members will have full control over which recommendations are approved and displayed, and will be able to enhance those endorsements with photos, videos and transaction information. They will also be able to share those recommendations on social networks. Although NAR touts .realtor sites as a marketing tool, some have worried that the trade group’s history of enforcing its trademark will lead to censorship. It also remains to be seen whether Realtors with well-established websites will be interested in the domain. NAR also applied for the .realestate and .home domains, but there are competing applicants for those domains and they have yet to be assigned, according to ICANN’s website. A similar domain, .homes, has been assigned to DERHomes LLC, a wholly owned subsidiary of Dominion Enterprises, which owns Homes.com and ForRent.com, among many other brands. NAR’s counterpart to the north, the Canadian Real Estate Association, has applied to ICANN to create and manage a new .MLS top-level domain with backing from the MLS Domains Association, but there is a competing applicant, Afilias Limited, and the domain remains in contention. Last year, CREA lost a bid to throw out that rival application.